Hennery Peck, more popularly known as Peck’s Bad Boy, was a fictional character created by George W. Peck, a newspaperman, in the 19th century. Hennery was a mischievous child whose doings became a popular term for any incorrigible rule-breaker. Hennery had a real-life counterpart in Russ Meyer, a right-handed pitcher for six major-league teams from 1946 to 1959, and known alternately as the Mad Monk, Russ the Red, and Rowdy Russ. Russell Charles Meyer was born on October 25, 1923, in Peru, a small city of around 9,000 inhabitants in north central Illinois about 100 miles from Chicago. All four of his grandparents were natives of Germany; his mother, Frieda (Neff) Meyer, and father, Henry, were both born in Illinois, At the time of the 1930 census, Frieda worked as a saleswoman in a retail bakery and Henry was a foreman in a plow factory, presumably the Peru Plow and Wheel Works, where a large number of their neighbors also worked. Russ got the “Mad Monk” nickname when he and four other teammates on his high-school basketball team shaved their heads before a championship game. The “Rowdy Russ” and “Russ the Red” monikers were a result of his antics on and off the diamond, which sometimes outshone his pitching capabilities. Roberts in his autobiography recalled an incident in 1953, after the Phillies traded Meyer to the Brooklyn Dodgers. Pitching against the Phillies in Connie Mack Stadium, Meyer walked Richie Ashburn with the bases loaded, forcing in the go-ahead run. Meyer charged off the mound to protest to umpire Augie Donatelli. Meyer’s language got him ejected by Donatelli. But he returned to the mound and just refused to leave until manager Charlie Dressen came out to get him. Finally Russ stomped off the mound. As he did, he flipped the rosin bag into the air with disgust. The rosin bag flew 30 feet in the air and came down directly on Meyer’s head. White powder flew everywhere, and even Monk had to laugh a little, Roberts said. 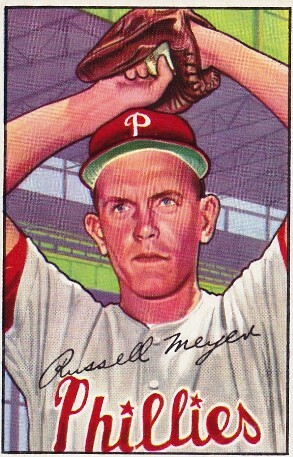 In the 1950 World Series, Meyer pitched in relief in Games One and Three as the Yankees swept the Phillies. He was the loser in Game Three, giving up the winning run on three straight singles in the ninth inning. The trade to the Dodgers rejuvenated Meyer. In his first season he won 15 games and lost 5 as the Dodgers won the pennant. In his only appearance in the World Series, he pitched 4⅓ innings in relief of Johnny Podres in Game Five, giving up four runs. In 1954 he won 11 games and in 1955, pitching mostly in relief, he won six. In the ’55 World Series, against the Yankees, Meyer relieved Karl Spooner in Game Six and pitched 5⅔ innings of scoreless relief. After the 1955 season Meyer was traded to the Cubs, where he went 1-6 in 1956 and was sent on waivers to Cincinnati in September. Just before the start of the 1957 season the Redlegs sent him to the Boston Red Sox on waivers. He pitched in only two games for the Red Sox and spent the rest of the season with Nashville and Seattle. He was out of baseball in 1958 but signed with the Kansas City Athletics in April 1959 and pitched in 18 games (one victory in relief) before being released in July. His career numbers for 13 seasons in the majors were 319 games played, 219 games started, 94 wins, 73 losses and a 3.99 earned-run average. Not a bad journeyman’s journey. During the 1953 and 1954 seasons Meyer became one of only three pitchers who went at least 24 road starts without a loss. The others are Allie Reynolds, who holds the record at 25, and Chris Young, who also started 24 road games without a loss. Meyer’s travails, antics, and explosive temper put him in the same league as other characters like Bobo Newsom, Al Schacht, and Willie “Puddin’ Head” Jones. He may have been a knockoff of Peck’s Bad Boy, but he was honest and warm-hearted, and saw life as something you fully live and take the consequences. He may have been crude at times but he was never malevolent. Meyer died on November 16, 1998, in Oglesby, Illinois. He was 74 years old. He was survived by his wife, Dorothy, and three children. Brown, Hugh. “The Terrible Tempered Russ Meyer,” Sport Magazine, December 1952. Paxton, Harry T. The Whiz Kids — The Story of the Fightin’ Phillies (New York: David McKay Company, 1950). Ryan, Jack. “From Redneck to Blueblood by Way of Poise and Avoirdupois — That’s the ‘Inside’ on Cubs’ Russ Meyer, Baseball Digest, September 1948. 1 Robin Roberts and C. Paul Rogers III, The Whiz Kids and the 1950 Pennant (Philadelphia: Temple University Press, 1996), 158. 2 Roberts and Rogers, Whiz Kids, 158. 3 Roberts and Rogers, Whiz Kids, 152, 158. 4 Robin Roberts and C. Paul Rogers III, My Life in Baseball (Chicago: Triumph Books, 2003), 112; Roberts and Rogers, Whiz Kids, 152-54. 5 Roberts and Rogers, My Life, 133; Roberts and Rogers, Whiz Kids, 156-57. 6 Roberts and Rogers, Whiz Kids, 181-82. 7 Roberts and Rogers, Whiz Kids, 307. 8 Roberts and Rogers, Whiz Kids, 52-54. 9 Roberts and Rogers, Whiz Kids, 54. 10 Roberts and Rogers, Whiz Kids, 154-55.